On the life, theory, activism and humour of Doreen Massey, the great feminist geographer, who has died. 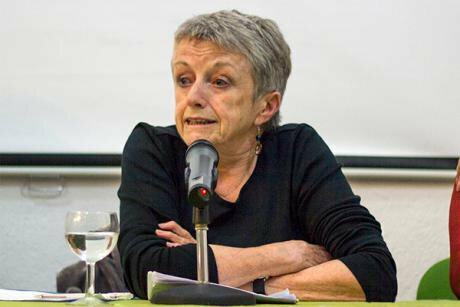 Doreen Massey, socialist feminist, engaged geographer and influential public intellectual has died, during the night of March 11th, aged 72. Tributes are pouring in through social media. 'Now we understand what everyone else felt about David Bowie', was one attempt to convey the scale of our loss. Doreen's body could sometimes be frail but her mind was brilliant and tough. As a character she was strong, passionate, curious and also imbued with modesty and kindness. She radiated political energy and humanity, sparkling with a cheeky wit. With a steady flow of books, such as For Space, The anatomy of job loss, and Space, Place and Gender and contributions to the books of others such as Huw Beynon's Digging Deeper, a collection on the politics of the 1984/85 miners strike, she worked alongside others such as David Harvey, to establish geography as the intellectual source of a powerful, integrated critique of predatory capitalism in the age of climate change and the corporate driven global market. She was proud of winning the Prix Vautrin Lud ('Nobel de Geographie') and she organised a celebration with her large and varied circle of friends in typically convivial Doreen style. On the other hand, she was appalled to hear that the vehemently hated establishment wanted to award her an OBE. The result was an urgent phone call to get contact details of other refuseniks of royal awards Ken Loach, John Palmer and more in order to plan how to ensure that her refusal had a maximally anti-royalist impact. Her strong sense of class underpinned all her politics; it drove her energetic support for the women in the mining communities during the 1984/85 strike (we went together to Blidworth in Nottinghamshire to give moral and practical support to the local pickets and Women Against Pit Closures; and it was one reason for her enthusiasm for Jeremy Corbyn's leadership of the Labour Party and the possibilities it opened up. (Indeed the last time I was with her was when together with Chantal Mouffe, another close Kilburn friend, we discussed what we could DO to support Corbyn's leadership). “Think, for instance, of that bundle of words 'investment/expenditure/speculation'. Each term bears moral connotations: investment good thing; expenditure a cost, possibly a burden; speculation in a financial sense a bit dodgy. Now think about how we use these terms in popular and political discourse. The radical, socialist and labour movement think tank CLASS (Centre for Labour Studies) was another important platform for Doreen and her work for them was greatly appreciated by its staff. Her upbringing in Wythenshaw, one of the largest council estates in Manchester was a constant reference point in our political discussions and I think it fired her fury at class exploitation and the exercise of ruling class power, intertwined in complex ways with the inequities of economic geography and of gender and race. The North West remained a focus for several of her life-long passions. There were constant train journeys from Euston to Liverpool to cheer on her football team, to which she was fiercely loyal and then on to Ulveston, to stay with her much loved sister Hilary, go walking with her and do a bit of bird watching (another of Doreen's enduring loves) in the inspiring fells of the Lake District. She was also passionate about London, her city of residence and often of study. She was an active architect and engineer of the Greater London Council under the leadership of her friend and Kilburn neighbour, Ken Livingstone. She became a member of the Greater London Enterprise Board on which fellow board member, John Palmer remembers how she 'would ask searching questions on issues surrounding the advancement of the rights of women and ethnic minorities in the preparation of development strategies for GLEB investments.' And Robin Murray also a member of the board as Economic Advisor to the GLC, describes how she 'insisted that space was social not just physical: gendered space, class space. She brought these perspectives, which enlightened so many, to the deliberations of the GLEB Board as they considered how the GLC principles could be translated into the concrete projects that came before it. Several of us, including Robin and one of her co-founders of Soundings, Mike Rustin also remember the Ariel Road group that met with Ken Livingstone in her front room after Mrs Thatcher's abolition of the GLC, and how, in Robin's words, 'a great theorist was equally at home in discussing the key political issues of the day'. In addition to her long involvement with Latin America, she also worked with South African activists. During the transitional government, she worked with Frene Ginwala, later the first person of colour to become Speaker of the South African Parliament, in a workshop on gender and unpaid labour, at a time when such issues were sidelined in economic debate. “It was an extraordinary event,” remembers another friend, Maureen Mackintosh, also involved with the struggles in Southern Africa. On a personal note, I came to know Doreen through both of us becoming trustees of a charity whose mission was to fund education and research about socialism. And it was through the Trust that we discovered we shared the same birth date. Our two older trustees at the time, doughty historian John Savile, and magisterial Marxist political theorist Ralph Miliband, suggested a date for the winter meeting: January 3rd. We both muttered somewhat grumpily, 'but that's our birthday'. But as good soldiers to John Savile's military command, we went along with it. After a birthday drink we arrived at the meeting at the Miliband/Kosack home, to be greeted in the most chivalrous manner, by John and Ralph presenting each of us with a large bouquet! It was a fond memory of these two comrades over which we often had a good chuckle. How we will miss that chuckle! But we are fortunate that through the stunning (a favourite word of hers) range and scope of her writing, her ideas are still with us, though we are able to reinforce her influence. So she would want me to end this salute and make sure it resounds, with a sharp political remark. The opening of her recent Soundings blog would do the job: ever since Corbyn was elected, pundits have been predicting doom for Labour. In fact Labour's doom is more likely to be sealed if the party does not rally round and work to make his leadership successful. Whatever the party – and in particular the Parliamentary Party - does, friends of Doreen – a large and influential network – I know will rally round to remember Doreen and keep alive her determined spirit and ensure the continuing influence of her transfomational and deeply radical politics. Viva Doreen! Viva the transformation of geometries of power! Viva! You can read all of Doreen Massey's contributions to openDemocracy here.